The item Lady mechanika: the lost boys of west abbey, Issue 1, M. M. Chen, (ebook) represents a specific, individual, material embodiment of a distinct intellectual or artistic creation found in Charlotte Mecklenburg Library. 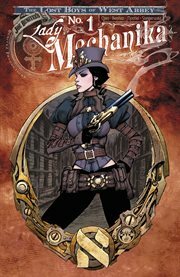 Lady Mechanika's investigation into the murders of "undesirable" children in Mechanika City triggers an unexpected reaction from her subconscious self. But are they truly lost memories finally surfacing after so many years, or just simple nightmares? And what connection does the killer have to Lady Mechanika's past?